Aston Martin's chief executive Ulrich Bez has just done what his former employer Porsche would not do - and he has turned up at the Geneva motor show to tell the world about it. Mr Bez is here to show off the British carmaker's latest concept, a sleek four-door, four-seat coupe, kitted out with a 5.9-litre V12 engine that will make it more than able to live up to its name: Rapide. "When I was [working for Porsche] I designed a similar car," Mr Bez tells BBC News, referring to his time as head of product design and development at Porsche. That was during the early 1990s, when Mr Bez was convinced the market was ready. Mr Bez insists the project was only shelved after his departure in 1993, when "the marketing people said, 'No-one will buy this car'," though industry officials suggest the design met plenty of resistance long before he left. Porsche has since changed its mind, though. Last year, it said it intended to build the Panamera - a four-door, four-seat saloon - after all. Aston Martin has not yet made a firm decision to produce the Rapide, though "if we build it, then we will build it in [about] 36 months' time", Mr Bez says. If so, the car could hit the road by the end of 2007 or during 2008. 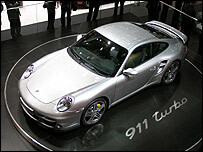 That would mean it would arrive in the market place before the Porsche Panamera, which will not turn up until 2009. Not that the two will be rivals, though. "I'm not looking at them," Mr Bez says. "We are different." 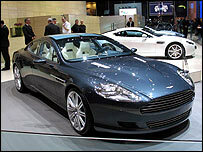 Indeed, Aston's Rapide would cost about $250,000, according to Mr Bez, and this, a Porsche spokesman says, "is a price category we're not looking at for the Panamera". 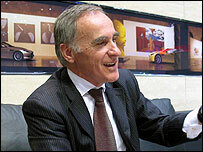 Moreover, whereas Porsche aims to sell 20,000 Panameras per year, Aston only want to shift about 300, Mr Bez points out. "It will not be volume, it will be the cream of the cream." Such talk does little to endear him to Porsche, whose stand in Geneva is right next to Aston's. "It's a nice game that [Mr Bez] is playing, but it's not such a big issue," the Porsche spokesman says nonchalantly.